Wheelys Café is a 100% green and organic bicycle café chain that launched in 2014 and operates in more than 45 countries, serving the freshest coffee on the plant. They’re engaged in a battle against the fast food giants to provide real coffee to the enlightened masses. 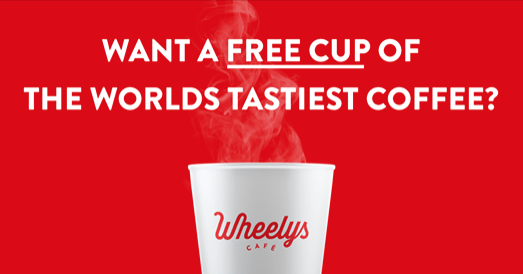 To achieve their goals, Wheelys is offering a free cup of coffee for everyone in the world, just as long as you live in or are visiting a participating city. To get your free cup of coffee, you must subscribe to the Wheelys Newsletter to get started. If your city is on the list, you are guaranteed a free cup of coffee at your local Wheelys Café. There are various participating cities in the U.S.A., Ecuador, Jordan, Norway, Poland, Romania, Russia, Slovenia, South Africa, Sweden, and Taiwan. If your city is not on the list, you can also write-in an alternative city, and it’s possible that you could receive a free cup of coffee if you live in any city where there is a Wheelys Location, but only residents of cities on the list are guaranteed to receive free coffee. You could also wait until you travel to a participating city, and then sign up for your free cup of coffee before your trip. Instead of spending money on advertising, Wheelys simply lets people try their coffee for free, so why not give it a try and join the struggle. Wheelys serves 100% organic and 100% fair trade coffee with no pesticides or other poisons. They describe their brews as a “wild and irresponsible mess of coffees,” including such blends as Indonesian Idolatry, Rwandan Rupture, Guatemala Gangrene, and Kenya Kamikaze. You could purchase your very own Wheelys Café, allowing you to sell coffee anywhere in the world. A Wheelys Café is easy to get started, has a low start-up cost, provides integrated marketing, offers high-flexibility, and can make you a lot of money. A Wheelys Café costs $3,000 to get started, versus a Starbucks chain, which costs $500,000. This opens up the possibility of owning a business to a whole new group of people, since 99% of the population can’t afford $500,000. All Wheelys have running water, 3 burners, cold storage, and an electrical engine to help you climb hills. Learn more about Buying a Wheelys Café if you are interested in being healthy and meeting tons of new people while making extra income. Take advantage of this opportunity to meet up with your local Wheeler for a free cup of coffee at Wheelys Café. You can also get a Free Coffee with the CUPS App at many independent coffee shops in the U.S.A.